During our visit with Wayne G. Brown at his home and studio, photographer Ron Howard and I caught only a glimpse of the large body of visual artwork he has produced during his 83-plus years. Brown is a painter, sculptor and printmaker, who has created landscapes, cityscapes, floral studies, abstract and representational works, and interpretations of music. His three-dimensional work, “Bach”, mentioned in Part One of this article, is only one of many of his creations that have been influenced by a spectrum of music that includes Sibelius, Shostakovich and jazz. He has painted scores of portraits and experimented with mixing media – applying oil paint over acrylic and adding cloth and twigs to canvas along with paint. His works reside at the Hedgerow Theater and Delaware County Community College, among other venues, and in many private collections. Brown custom made his grandest work, an off-white, twelve by nine foot cityscape, which he installed in the main lobby of Valley Forge Towers, a condominium complex in King of Prussia, Pa.
On a mild September afternoon, Brown gave us a tour of the home and surrounding garden he has shared with his wife, Elisabeth, since 1970. The couple met in Copenhagen and married in 1968. Originally from Sweden, “Lizzie” worked as a nurse in San Francisco and in Bryn Mawr, Pa. She learned weaving at a young age and took it up full time when she retired from nursing, as she recalls, “around 1980”. Using hand-woven fabrics, she weaves and designs women’s clothing. Mostly self-taught, her creations have sold through private homes, in specialty stores, at craft shows, and at a booth at the Devon Horse Show. She sold some of her fabrics to New York designers. Elisabeth maintains a studio in Lenni, Pa., and has shown her work at venues including Hagley Museum in Wilmington, De., and at the Chase Center with the Pennsylvania Guild of Craftsmen. Her husband was quick to point out that she created the lush, subtly-hued garden in which his outdoor sculptures are displayed, and seemed particularly delighted by her inclusion of banana trees, with their large, canoe-shaped leaves. An air of whimsy accompanies most of the work Brown has installed outdoors. Several of the sculptures in the garden are monochromatic assemblages of found and altered objects. “Green Sculpture” juxtaposes a hammer with a cracked handle, a desk lamp’s shade, a jalousie crank and a length of chain with scraps of wood. The elements have contributed their own character, weathering both the metal and wooden components. “Red Abstract”, is a busy, angular construction of rectangles, cylinders and spheres that suggests a town that has grown up a steep hillside through the centuries, bathed in the crimson of sunset. The off-white “Castle”, with its parapets and elongated spires, is reminiscent of the constructions of Ludwig II of Bavaria. 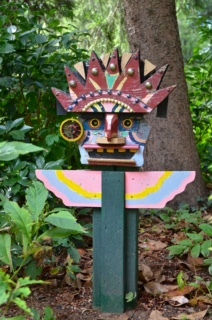 Sporting a pointed crown, the multi-colored “Inca God” stands upright in front of a tree, smiling, or perhaps, grimacing. What looks like a miniature wagon wheel adorns the right side of its face. In addition to earning a B.S. from the University of North Carolina, Brown received an M.B.A. from Temple University in Philadelphia. He went on to a long and varied business career, working for Smith Kline & French, Wyeth Pharmaceuticals, Temple University, and Thomas Jefferson University in Philadelphia, among other institutions, and finished at the mutual funds company Vanguard, an experience he characterized as, “very positive.” All the while he pursued his art education at the Pennsylvania Academy of the Fine Arts (PAFA), Tyler School of Art at Temple, the Chautauqua Institution’s School of Art in western New York state, and Philadelphia College of Art (now The University of the Arts). He has also studied at community art centers in Abington, Cheltenham, and Lower Merion, and most extensively at the Community Arts Center in Wallingford, Pa. The geometric figures of the wall sculpture, “Cityscape”, are of wood, painted in mostly cool hues. The piece can be perceived either as an aerial view or as one of a harbor and buildings that reach toward a background of foliage. As with most of Brown’s works, and especially his abstracts, the viewer is left plenty of room for imaginative exercise. Some shapes recall awnings while others appear as residential and commercial properties. Another wall sculpture, “Triptych”, is a castle’s façade in predominately gold, green and red. A sylvan scene is glimpsed through its pillared front gate. The bespectacled face of “Numbercruncher” winks at the viewer, while what look like computer parts lodge under its dome and where its heart would be. Brown has carried off numerous awards for his wall sculptures – sometimes referred to as assemblages – in several contests, including First Prize at Wallingford’s Community Arts Center in 1993 and again in 2008. He won pairs of Purchase Awards in the Delaware County Community College Annual Juried Show; in 2003 for an acrylic-on-paper work and a wall sculpture, and then for two paintings in 2006. That year he also received the Director’s Award for three self-portraits, two painted in oils and one in acrylic, at the Community Arts Center’s In-Person Show. Brown won two Merit Awards, a Third Prize and an Honorable Mention, for works in various media, in competitions at the Delaware Valley Art League in 2002, 2005 and 2011. Brown offers these thoughts in the same candid and good-natured way that he addresses most subjects, i.e. : with a mixture of confidence and humility that no doubt stem from a lifetime of practice and innovation as an artist. Sharp of mind and sensitive to the beauty, the horror and even the mundane experiences that life presents, he acknowledges his good fortune and responds to it with multi-faceted creativity. He shows no signs of slowing down. A Note About Our Publication: The SVJ Online is interested in your articles about art and artists. Queries and/or submissions can be send to dpkozinski@comcast.net. Please insert the words “SVJO Submission” in the subject line of the message.